I received my set of Dodec Wheels from Porter Threads today. I purchased these spindle wheels for my Wooly Wednesday Workshop Series at the Public Library I work at. These are a very inexpensive version of a spinning wheel since they lack the bobbin and flyer component. There are also free plans for building your own wheel, which I lack the carpentry skills to create. I was able to buy two wheels, with four spindles and assorted parts, for less than $200. They arrived in two separate boxes taped together. Each box contained the wheel, two spindles, two drive bands, two pieces of paraffin, two crescent wrenches, and the wooden components that are easily assembled. Since it is raining today waxing or otherwise staining these wheels will have to wait. Assembling the wheels is as easy as taking the part with the pedal putting it on the ground, take the part with the wheel and slide it into the appropriate slot in the base. Each wheel also came with 2 spindles and two drive bands. Installing the spindles is a matter of unscrewing the rectangle of wood sticking out of the front, I am going to call it the front maiden, and installing the spindle. Finally screwing the front maiden back on. 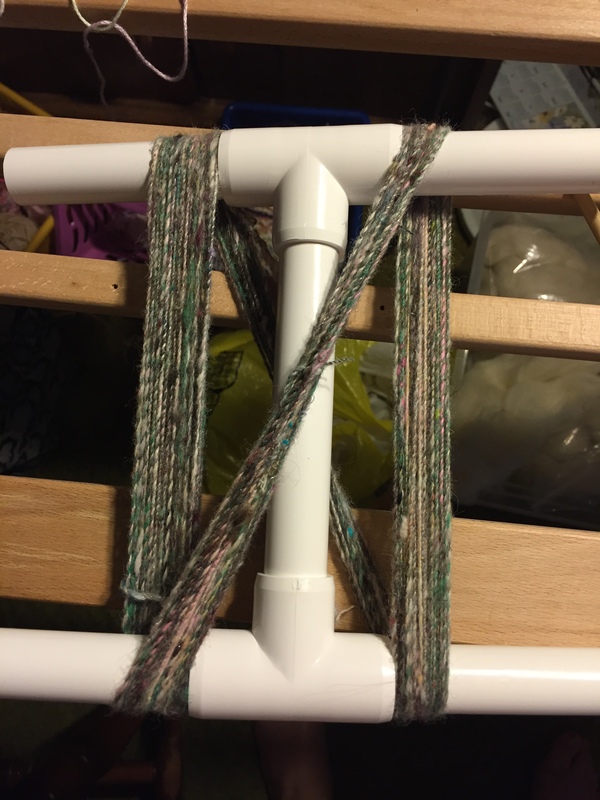 Then before you know it, you have the spindle installed and since the bulky portion acts as your flyer to turn the spindle you have that installed as well! Once you have the drive band stretched over the flyer piece and the wheel, hook the treadle to the drive wheel and you are ready to go. All of this took about fifteen minutes! I cannot wait to get started spinning on the spindle wheel to see how different it is from my Ladybug! I look forward to reporting how simple this is for my beginning students to learn this after their drop spindles. I love my Bottom Whorl Drop Spindle, the wooden one in the middle. This is what I started with, adn I adore it. 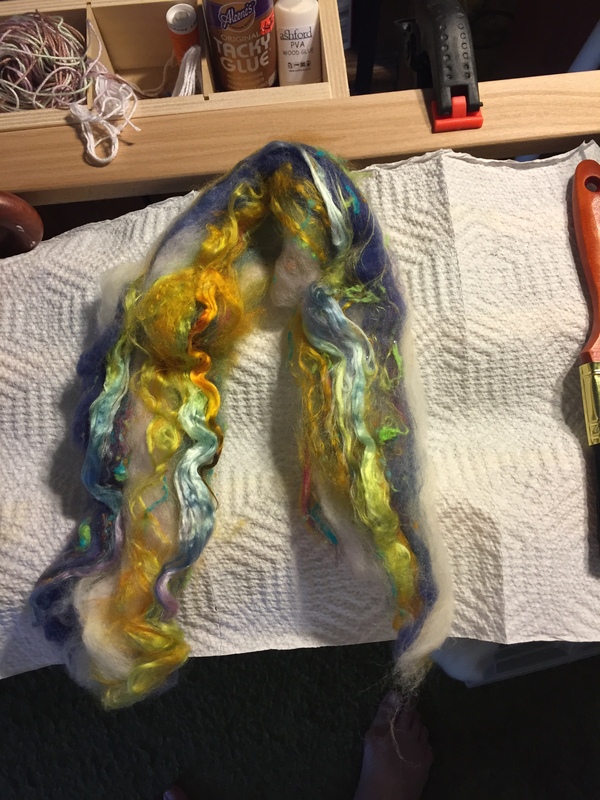 I can get a good long spin, it looks cool twirling around and the hook at the top is perfect for catching on when I’m twisting my fiber. Unfortunately within the concept of larger classes and getting people hooked on fiber arts, the price point is a little high for a giveaway. On the left is a Babe Spindle without the whorl. I needed to hit a price point to get free shipping on an order, the Babe Spindle cost less than shipping and allowed me to hit that goal so I ordered one. It really is a neat spindle, allowing the user to decide if it is a bottom whorl or top whorl spindle in addition to allowing you to decide if you want to put one or two of the whorl discs on the spindle. 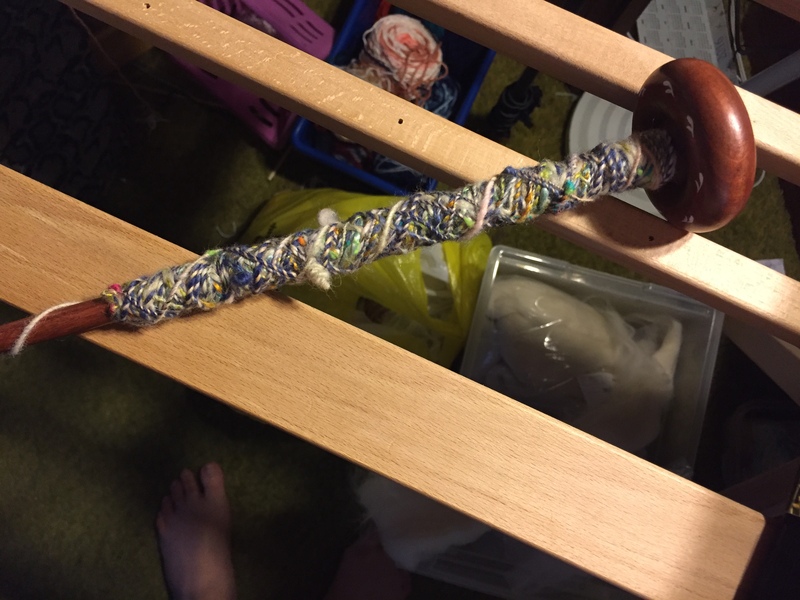 What I found neat is that if you keep the whorls off of the spindle entirely…or if they fall off because you didn’t put nearly enough tape on the shaft, oops, you can roll the shaft of the spindle down your leg and use the cup hook to hold the wool in place. 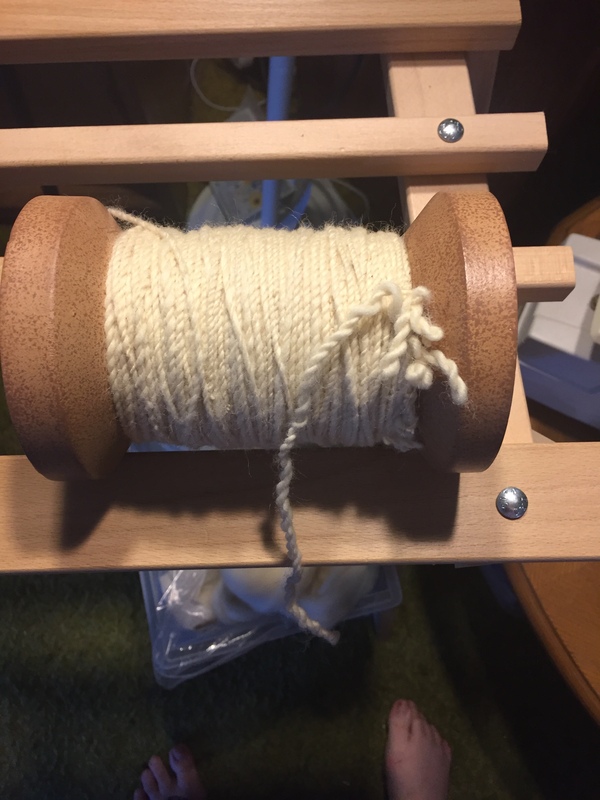 The shaft becomes a great little spindle, a bit awkward and no independent spinning like with my original spindle, but you have a lot more control over how the shaft spins, very neat. This becomes a bit more of a reasonable price point, all a teacher would need to provide is a stick (dowel) with some cup hooks screwed into the top. (also Wool) Dowels are not that expensive, the cup hooks aren’t too bad price wise…I’d just have to find a way to get the cup hook into the dowel without it splitting. I think I saw something about putting a nail in first to keep the wood from splitting, definitely worth considering. Now, recently Mayan Spindles, I can’t really find out where the name came from as it does not seem to have anything to do with the Mayan Culture, have been showing up more in popular culture…okay, popular spinning culture. This is a dead simple way of putting twist into fiber, attach the fiber on one arm, spin around, and voila yarn. The spinning motion is very big and completely controlled by the spinner. But the price point just went up again, a wooden Mayan Spindle (Spinner) is about $20, whew that’s a bit rich for a teacher. However, doesn’t that spinner look a bit like a propeller? I looked up plastic propellers on Amazon, lo and behold, they have 12 plastic propellers in a pack for under $5 with free shipping. Okay, they came from China, and I’m washing them in hot soapy water before using because I’m a little paranoid. (I didn’t realize that the Sari Silk from India might contain some really nasty diseases that are fairly rampant over there). I try to Order American when I can, if you know of an American equivalent/retailer let me know, but these are fantastic. They spin, just a tiny bit, on their own but allow for complete control. They are lightweight and easily spun in one hand. It is very easy for the spinner to see the twist as it enters into the fiber. At about .25 each, they are cheap enough to be a giveaway that doesn’t hurt the pocket book. I do think that I will glue the shaft to the propeller before showing these to anyone else, but it really does make for a great spindle alternative. So, these are my Spindle Explorations! I managed to download this pattern from Thingiverse and it was created by kg6gfq. One of the libraries that I work at obtained a 3d printer about a year ago but I have not heard of it being utilized too much. Being the very curious person I am I decided to poke that particular rattlesnake and print something out. I checked out Thingiverse and found Drop spindles, bobbins, even the plans for an Espinner out of printed materials. I was over the moon, so I downloaded the ones I liked, came into work a couple of hours early, and started to mess around figuring things out. The first thing I found out was that none of the files were in a format I could use. Some checking around led me to believe that I needed them in Makerbot Formula. None of the libraries computers had that format so I would have to bring my laptop next time (my home computer is a Mac but my Laptop runs Windows 10) install Makerbot and see what I could do. The next week I brought my laptop in (I only work at that library once a week) downloaded the software and began to convert the files, it was actually pretty simple once the program was installed. I was very happy thinking that I would now be able to print out, at least, my 3d spindle. I went home pleased with how next week was going to go. The third week into my venture I went to work an hour early to see about getting my printout started. I plugged my usb drive in and went through the materials I wanted printed. Everything worked perfectly, time estimates, printing sizes, etc. Except that nothing would print out. There was no filament waiting to be used to print. Darn. I looked around a bit and finally had to admit, I was going to have to ask someone. After a couple of e-mails and a further couple of weeks I now have my 3d printed turkish spindle. While it would have been a lot less aggravation to just order the thing from Turtlemade or another company that prints them, I am pleased that I now know how to convert a file to be usable on a Makerbot printer. My next steps are to see about creating an original pattern to print out, finding out what they are going to charge in the future for printing jobs, and testing out my spindle. I knew I should have brought fiber to work with me, lol. This is my brand new batt from Crafty Creations out of Missouri. It is a fantastic piece of fiber, and I have already started spinning it. 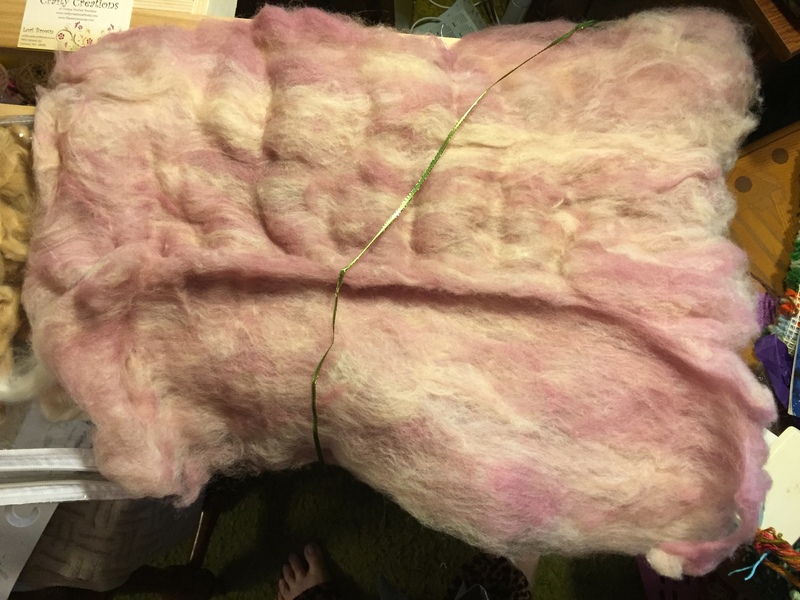 There is an amazingly bouncy texture to this fiber that makes if very different from the Corriedale that I have been spinning. I did split the batt into three sections and I am spinning each section separately, at the end I hope to have a three ply yarn. Which yielded about 16 yards. I have that knit up but could not stop there! I am currently waiting with baited breath for my next Batt from WoolieBullie. So exciting, I hope that there will be enough to make a very nice scarf or cowl. 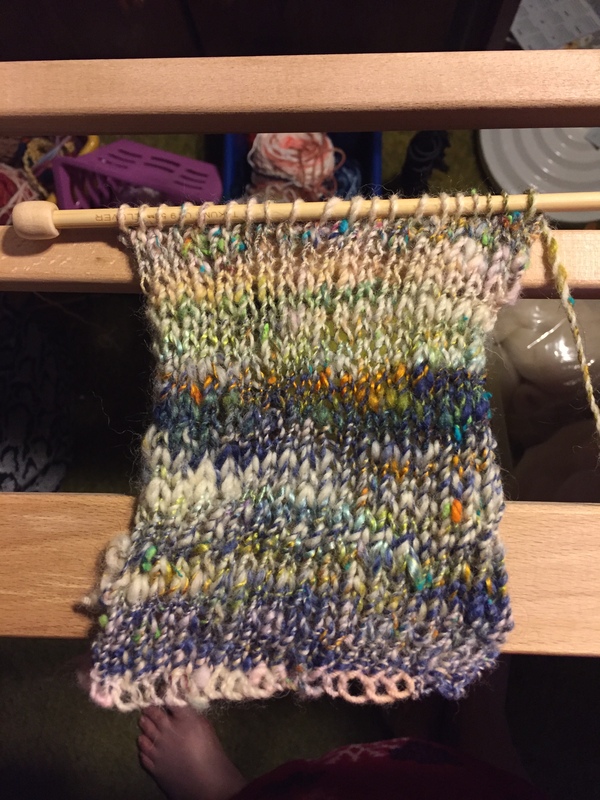 I believe that when I finish knitting and wash the product, gently with Dawn, the finished knitted fabric will full out a bit and cause the absolute end product to look a bit different from this beginning. For the WoolieBullie Dingbats, I highly recommend them. 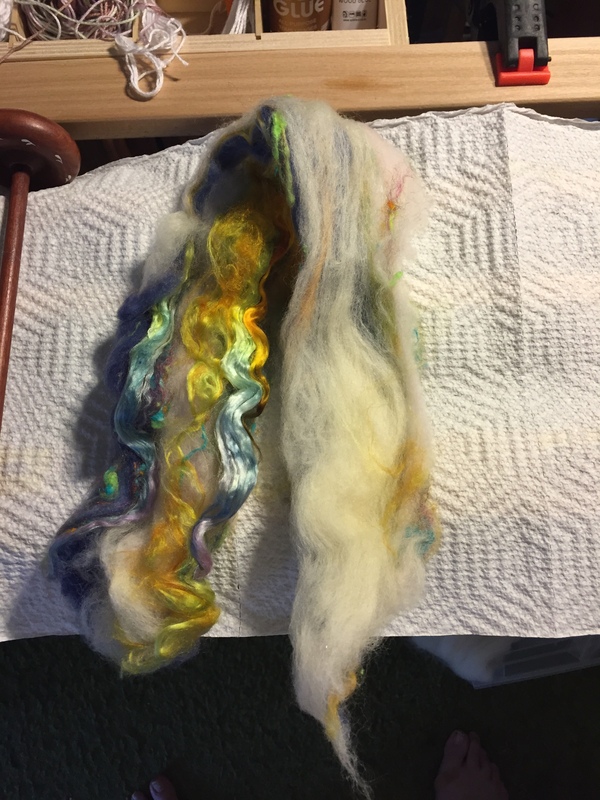 My first batt spun very quickly and easily, while it looked like there was a lot of white the end product was very colorful. 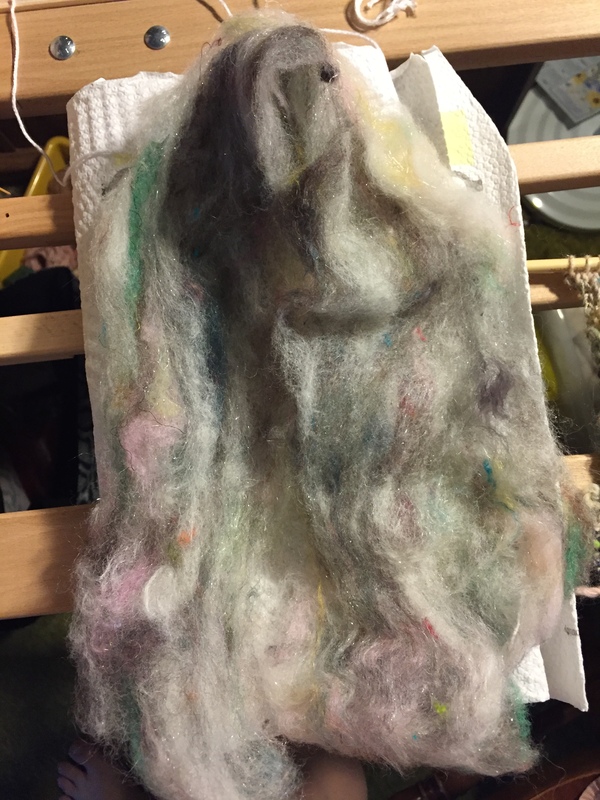 There seemed to be a bit of a sticky substance on my second batt, but I believe that this is the result of having a few beautiful curly locks in the fiber and just surprised me instead of detracting from my spinning experience (obvious since I am getting another batt!). I managed to Ply 2 of my Corriedale Singles into a very nice ply. Okay, since I overspun in a few places I did wind up with this huge snarl in my plying. After fighting with it for a few minutes I just went around it and plied the rest of my singles. There is enough left of one of the singles for me to try Navajo plying, when I get up the guts to do so. Right now I am going to enjoy my 2 ply yarn on the lovely decorative spool mom bought me. I will also not do any more plying until I have a tensioned Lazy Kate, quite a while in the future I’m thinking. Oh well, I’m enjoying spinning and getting the right amount of twist and yarn size. 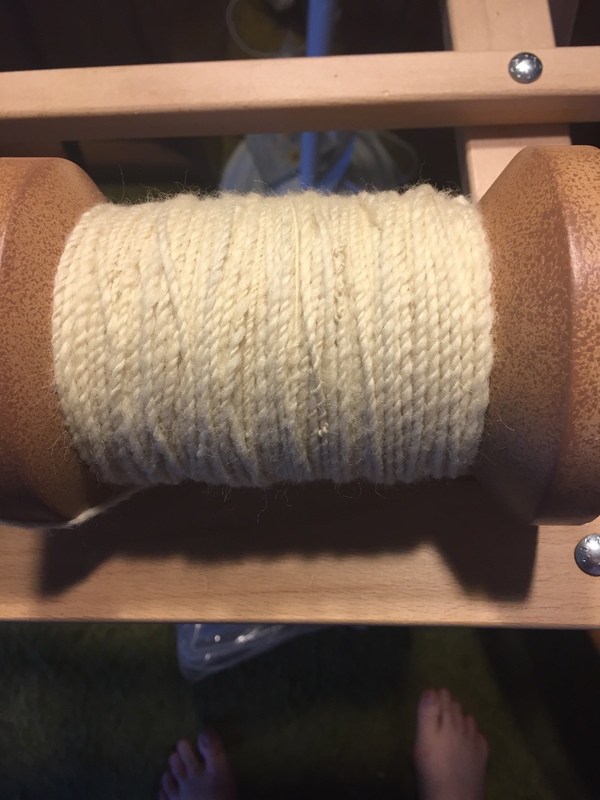 Tonight I spun two more singles from my Corriedale fiber. 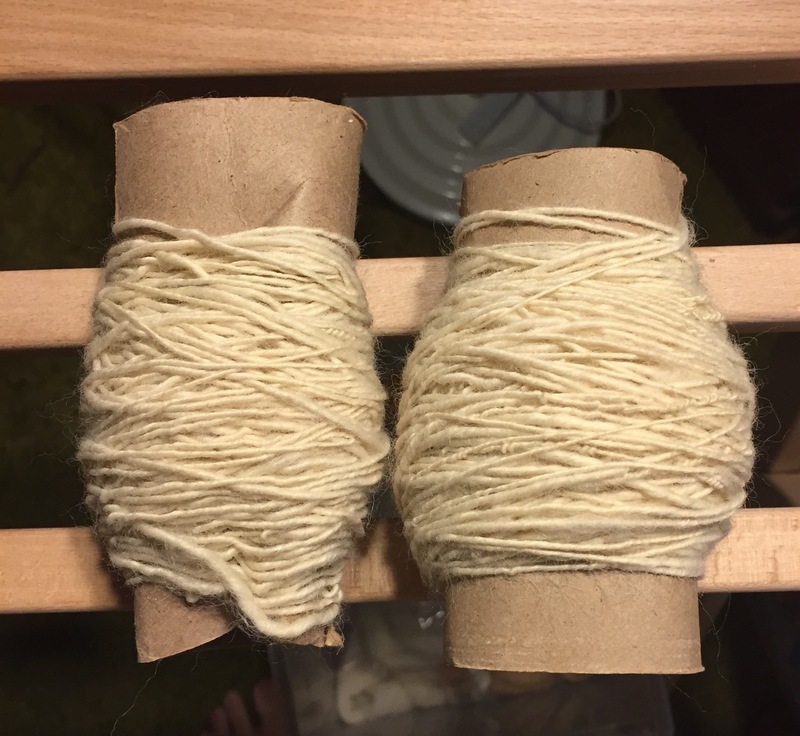 Each one weighs about an ounce, the single on the left was spun second and the fiber was weighed before I began spinning. They will rest overnight and if all goes well I look forward to plying them sometime tomorrow. 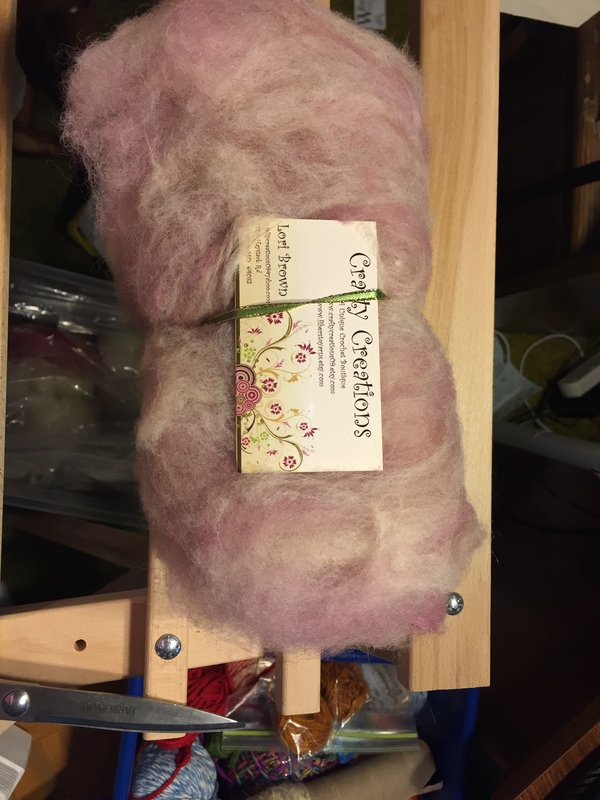 As you may know I am planning on exploring my new interest in fiber arts, from spinning to weaving. 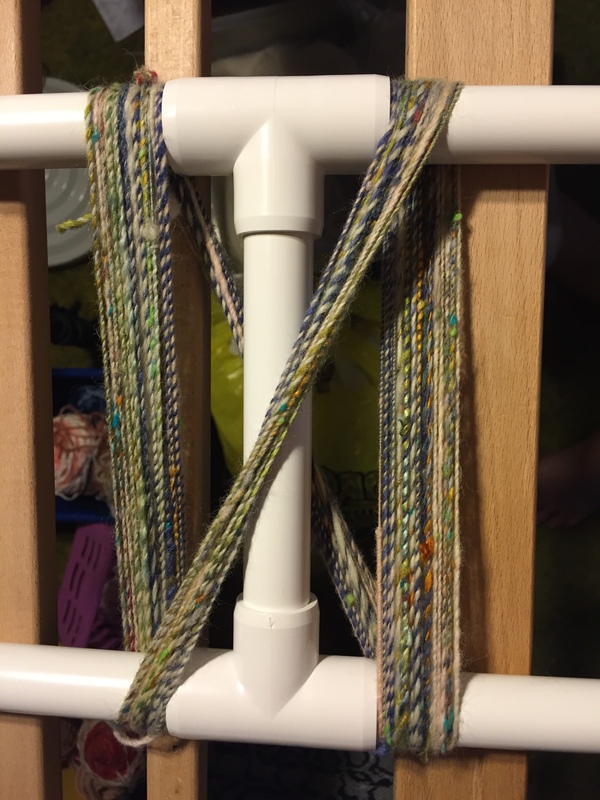 Right now I am not sure if I want to pick up an inkle loom and see if that kind of weaving interests me or if I should just hold out and get a rigid heddle loom after I get my spinning wheel. Oh well, plenty of time to decide!